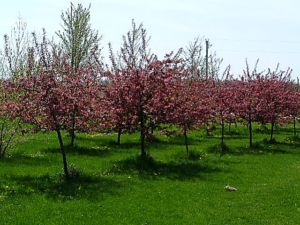 Kickapoo Creek Nursery has a selection of trees that form beautiful flowering buds in the springtime. 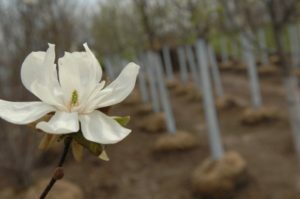 Dogwood, Crabapples, Serviceberry, Magnolia and Pear trees are some of our favorite trees in shades of white, pink and red. These trees produce blossom or catkins before their leaves start to appear. Why does this process happen? With more daylight and warming temperatures, it creates the necessary environment to make food reproduce. Here are some of our springtime favorites, make sure to grab one for your yard! 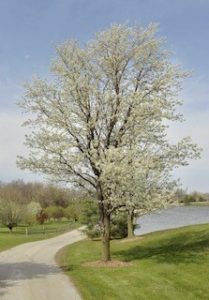 This narrow, upright tree will brighten your yard with it’s white colorful blooms. You can use this tree to provide screening because of great columnar shape. At full maturity, it will reach 20-30’ in height and a spread of 15-20’ at a fast rate. Full disclosure, this tree does not include edible pears. But this pear tree’s beautiful views make up for it! This spring classic is known for it’s delicate white petals that bloom around May to June. It has a distinct round shape that full of luscious color and character. This sturdy tree is a great choice for your yard, given that it fights disease and pests compared to other native flowering Dogwood trees. The Kousa Dogwood will grow to a mature height of around 15-25’ and a spread of 25’ at a slow to medium rate. Pick this tree if you want to hear a collection of songbirds and will give amazing color from spring to fall. With vivid white fragrant flowers and smooth gray bark you can’t go wrong with a Magnolia tree in your yard. You can expect blooms around April, depending on location it may be sooner. It grows in an oval, pyramidal shape that will grow to a mature height of 15-20’ and a spread of 10’15’. Plant this peaceful tree in your yard today!